November Roundup: The post by Influential Voices blogger Dr. Suresh Gettala, Talking Quality to the C-Suite, looked at how quality professionals, certainly experts in their field, may fall short in selling quality to top management and offered his perspective and advice. 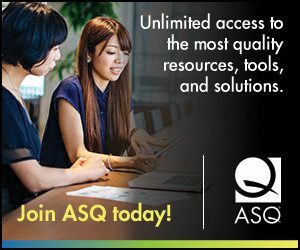 Throughout the month of November, ASQ Influential Voices bloggers contributed their ideas on talking to top management about the importance of quality. This month’s topic certainly generated some very interesting and somewhat diverse opinions. Pam Schodt responded that any quality discussion with the C-Suite should be tailored for that audience and provided suggestions for accomplishing that in her post Corporate Communication, 5 Keys to Success. Jennifer Stepniowski agreed that getting the attention of senior executives can be challenging and added even more tips in her blog, C-Suite Speak… “Quality.” She advised that quality professionals remember a call to action which needs to be clearly expressed and not just implied. Robert Mitchell agreed that quality professionals need to speak the senior executive’s language in his post Talking Quality with the C-Suite. He wrote that his 34 years of experience in a global manufacturing company echoed and reinforced much of what Dr. Suresh suggested. Dr. Manu Vora wrote that the easiest way to connect with C-Suites is to use the cost of quality approach which he explains in his post Talking to the C-Suite About Quality. He says this tool lets executives know where there is waste in the system and how they can reduce the Cost of Quality through continuous process improvements. Nicole Radziwill wrote that it’s important to let the C-Suite know that you can help them leverage their organization’s talent to achieve their goals, then continually build their trust. In her blog, If Japan Can, Why Can’t We? A Retrospective, she added that the key to talking quality with the C-Suite is empathy. Edwin Garro recalls a fascinating lecture by Deming and his startling answer to an audience member’s question in his college days. In his blog, Deming and the C-Suite. A Life Time Lesson for Management and Engineering Students, he writes that Deming’s definition of an effective C-Suite manager was one who understood variation, not one who forgets the voice of the customer, employee and the process itself. In her response and blog, AUDIT, a tool to talk with the C-Suite, Jimena Calfa agreed that talking to the C-Suite about Quality is a real challenge as senior executives often consider quality to be a waste of money instead of THE tool to increase profit. Tim McMahon wrote that getting executives in your company to want to support and then adopt Lean Thinking may be difficult but not impossible. In his blog, 5 Ways to Get Management Buy-in: What’s in it for me?, he shares a list of ideas to help you convince your management to start thinking Lean. However, John Hunter had a different perspective in his post Making Your Case to Senior Executives. He believes success will come from concentrating on short term financial measures while also crafting a story to make your case for long term improvements. Scott Rutherford also shares a different approach in his post You are not selling Quality to C-Suite. You are selling short-term relief. While changing corporate behavior from below is challenging, he believes there are ways for quality practitioners to have influence.